The Agriair® PAC air purifiers are designed for highly sensitive environments at risk of bio-contamination, such as cannabis drying, trimming and packaging areas. They effectively eliminate mold spores, powdery mildew, viruses, VOC’s, odors and even sub-micron particulates, preventing any microbial contamination of your final cannabis product. The units contain a powerful combination of medical grade HEPA filter, bank of UV Germicidal lights and ionic oxidation (IO) generators that provide multi-level purification of air passing through the unit plus sanitation of the air and surfaces in all the surrounding areas. Contaminated air passing through these units is first irradiated with UV Germicidal lights, killing viruses and bacteria which are then removed together with particulates by a Hepa filter. The purified air is then mixed with friendly oxidizer plasma generated by the IO module and is released into the surrounding area killing any mold spores, mildew, viruses, VOC’s and odor. The PAC air purifiers offer variable speed airflows to create a high level of air sanitization in small to large indoor commercial spaces. 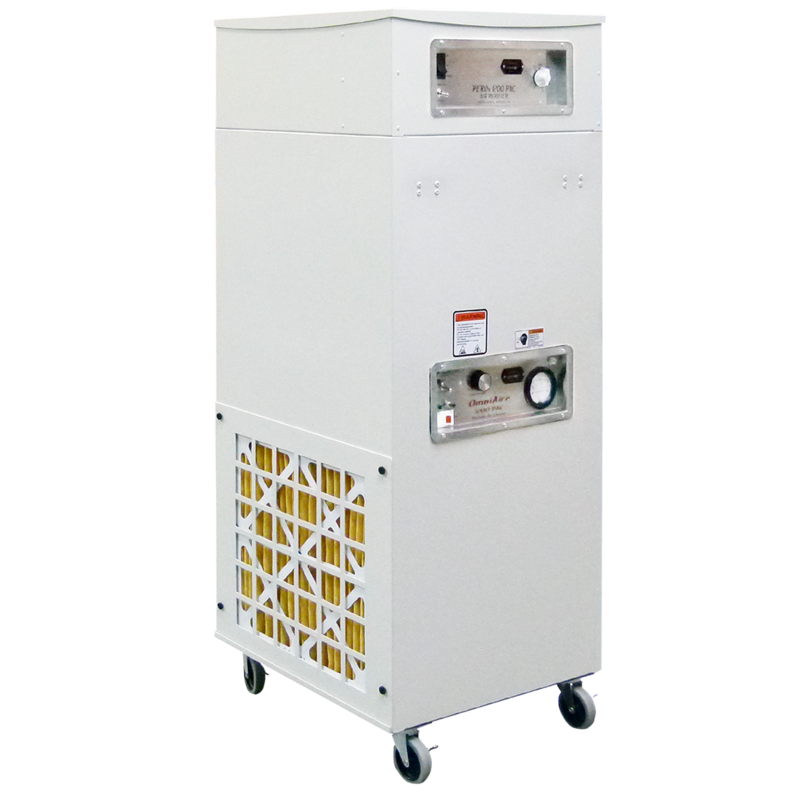 The unit is portable, quiet, lightweight and has a small footprint to operate in occupied spaces, dispensaries or processing areas. These units can be used as air scrubbers to re-circulate and purify air or create either positive or negative air pressure environments. An economical, safe and effective solution to many of the major air quality concerns of indoor commercial growers.